The PTO had a great time at Orientation and Open House this past Thursday and Friday! On Thursday morning we had all of the new Kindergarteners and their families at the school for Kindergarten orientation, and it was a quite a parade of cuteness. The new little Panthers visited their classrooms while their parents had an orientation session with Mrs. Jeck, Mrs. Ball, and the Kindergarten teachers in the cafeteria. After the parents had also visited the classrooms and reunited with their students, they were able to try out the lunch line — the quesadillas and popcorn chicken were a big hit! — and take a ride on a school bus. Every Kindergartener also received their very first Spirit Stick as a back-to-school gift! On Thursday afternoon the school offered orientation for new students in grades 1-5, followed by Open House for all returning students in grades 1-5. On Friday morning the Pre-K students had their very own Open House, where they were able to visit their classrooms and meet their teachers. The PTO had a table set up on both days offering information about the PTO, a collection box for Box Tops, and Spirit Sticks for sale. 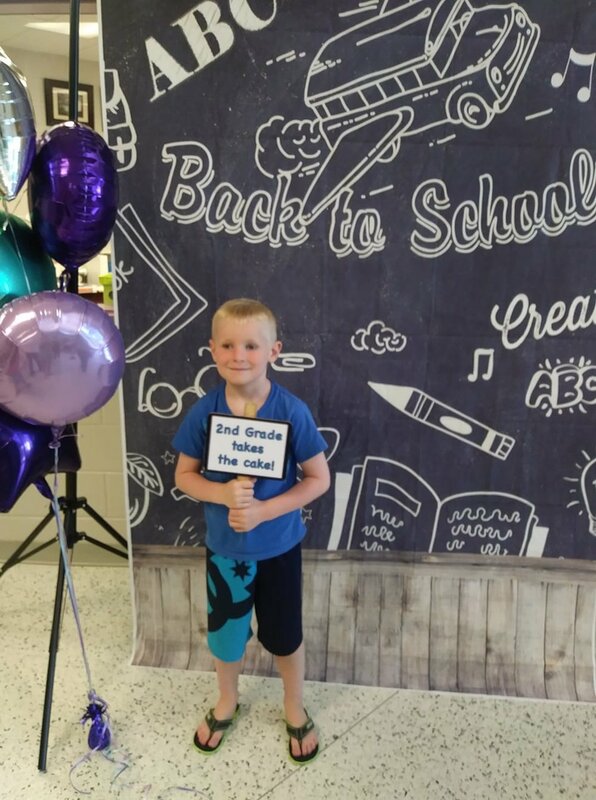 We also set up a photo booth where parents were able to take back-to-school pics of their kids. Huge thanks to everybody who stopped by the PTO table to sign up for the newsletter, drop off Box Tops, buy Spirit Sticks, or just say hi. Have an awesome first day of school!